Every player gets unlimited attempts to throw several combinations of dices, which make the game different then the average multiplayer dice game out there. If the player is not able to make any combination given he/she lose his/her turn. The game is heavilly based on gamble and luck. This free gamble game comes with multiplayer support. Look at this list with features for this free gamble game which is basically just a multiplayer dice game. 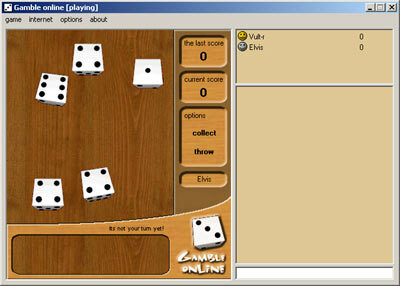 - Dice simulator that keeps and calculates your score. - A new and exiting dice game! - Play against bots (AI's) or your friends on the internet! - Join-in on (already running) online games at any moment. - Supporting up to 4 players same time. - Extended IRC style chat functions : /me. - Private and public chatting. - Random generated game data and events. - This free dice game has an easy installer. - free gamble game with multiplayer support. This is a screenshot of this free gamble game. The screenshot is resized to fit on the website. The size of the actual game is bigger.